Japanese car manufacturer Toyota has a fresh take on the automation trend. It's replacing robots and bringing people back onto its production lines – a move that is yielding results by putting faith in human innovation. "We always start with manual work." Picture a 21st-century car factory. In your mind's eye you can probably see a lab-like sterility, glossy cars rolling off the line. And everything lovingly handled by robots – not a human in sight. If there's one place we think robots have already replaced us, it's in car manufacturing. Prepare to have your preconceptions challenged. It's quite the opposite at the world-leading Toyota car plant in Nagoya, Japan: One of the leaders in the auto industry is boldly bucking the trend and throwing out the robots to replace them with humans. Meet Mitsuru Kawai, the modest 70-year-old man behind this seemingly counterintuitive move. Kawai started at Toyota when he was 15 as a common worker in the forging shop. Today, as head of manufacturing and executive vice president of Toyota, he is responsible for all Toyota plants worldwide. That's for a company with almost 360,000 employees and arguably one of the most innovative car manufacturers in the world. 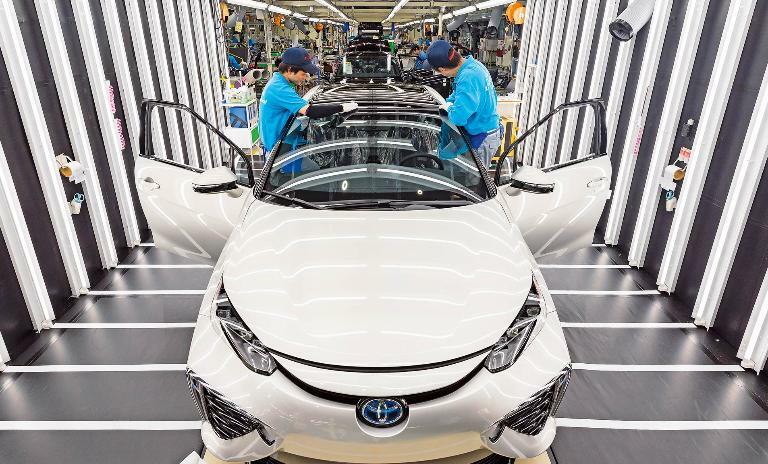 Focusing on human skills: The Motomachi Plant focuses on manual labor on the Mirai production line and serves as a training facility for Toyota employees worldwide. Built to innovate: A Mirai production line team member repositions tools that have been designed to move on the factory floor. 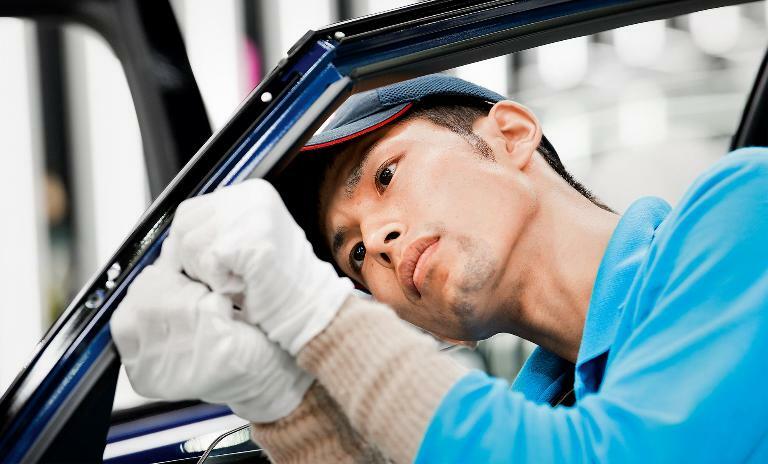 Handcrafted: A Toyota employee assembles a door window frame on the Mirai vehicle without robotic assistance. Not a robot in sight: The Toyota Mirai is 100% human-made. 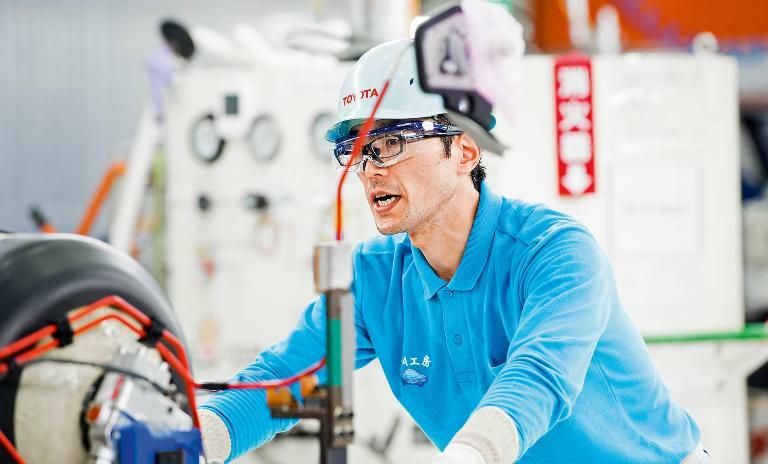 He clearly feels at home on the factory floor as he quietly conducts a tour of the plant at the company's headquarters in Toyota City near Nagoya in Japan. Clad in a white-blue assembly jacket with the word "Toyota" printed above the left breast pocket, he is almost indistinguishable from the other workers busily running to and fro. He is, in fact, one of very few board members of a multinational corporation without a university degree. But for Kawai, that doesn't matter as he knows every nook and corner of his factory and can competently judge every move in production from practical experience. "We always start with manual work," says Kawai. "The automation process will progress, generally speaking. But when we use robots, they'll be trained by people who know what they're doing." In this simple sentence lies an entire philosophy: Kawai is throwing out the robots and replacing them with human workers – as often as he can. While everyone is talking about how robots will very soon be taking away our jobs, Toyota is shaking things up and charting out its own course. Even before Kawai took the lead at Toyota in 2015, the company's automation program was changing direction in many areas of production. Now, from the forging shop to chassis assembly and the paint shop, human beings are back at work again in places were robots were recently employed. As if to prove his point, Kawai lifts his voice above the hiss and hammering in the ultramodern forging shop. "See, only humans can do this, not robots," he shouts. Two workers are servicing mechanical parts, looking with trained eyes for the smallest cracks or irregularities and then polishing them carefully. Just under five meters away, the arm of a robot is pulling an iron rod out of a furnace, and shaping the red-hot metal on a press that will turn it into a crankshaft. What these robots are doing today was what Kawai did himself with pliers and a hammer when he began making cars for Toyota. "I built this robot line myself," he says proudly. Kawai is not an enemy of automation but, as a former worker, he has retained a great deal of distrust for machines, robots and computers. Perhaps with good reason. Toyota had been contending with quality defects, vehicle recalls and falling profits. In 2014, Toyota CEO Akio Toyoda publicly apologized and said his company was "grasping for salvation" after a safety issues dispute in the US. Kawai's appointment in 2015 was a landmark statement of a new beginning and heralded a return to tried-and-trusted methods such as manual labor, continuous quality improvement and cost reductions through the simplification of production processes and they have helped put Toyota on the road for an impressive comeback. 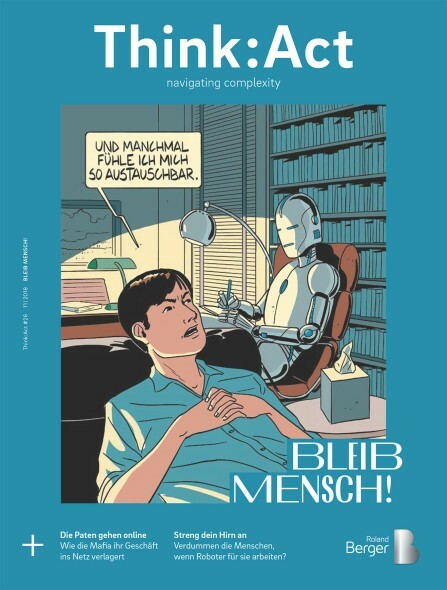 "Anyone can buy robots, but the knowledge to use them effectively is best acquired by oneself." Only those robots that work really well and are cost-effective still have a chance of keeping their jobs at Toyota under Kawai. He explains: After looking at the robots that weld together the base of the Toyota Land Cruiser, he noticed that the welding seam was too wide and had a few defects. "I shut down the entire robot line and I said: 'We'll do it manually again,'" says Kawai. Unlike the robots, human workers could see where a groove to be welded was one millimeter wide and where it was only half a millimeter wide and could then react flexibly. "The use of welding wire alone has decreased by 10%," he says with pride. The next step Kawai took was to ask workers to pass on their knowledge to the welding robots. He had them program the automatons themselves. Now the robots are back in operation, but where three employees used to have to re-weld the seams, one employee is now sufficient for quality control. The other two employees were not dismissed, but have been retrained for deployment elsewhere. Industry observers have taken note. 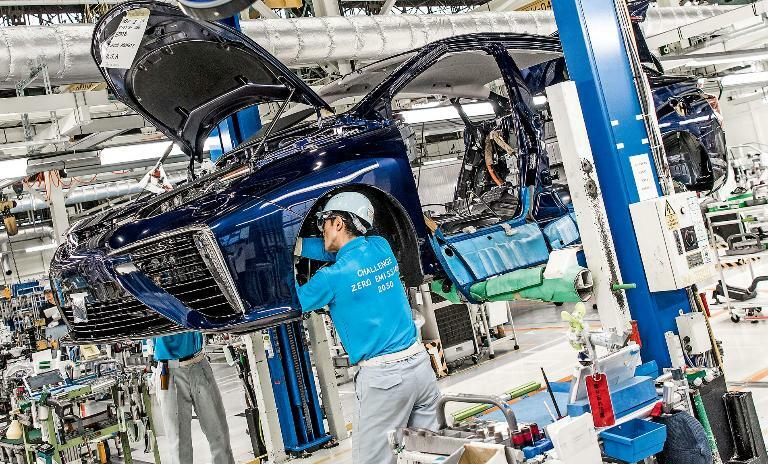 "When it comes to automation," says Hans-Jürgen Classen, a leading expert on corporate management in Japan, "Toyota relies on its own know-how rather than using external engineers and planning companies like other large car manufacturers do. Manual processes are perfected by the employees and only then automated again by the employees themselves." Classen adds that there's a lot of common sense involved. "Anyone can buy robots, but the knowledge of how to use them effectively is best acquired by oneself. Toyota is a global trendsetter in robot use, just as it was with its 'just-in-time' and 'lean production' methods which revolutionized the automotive industry." Surprisingly, the new methods did not come from inspiration at home in Japan. 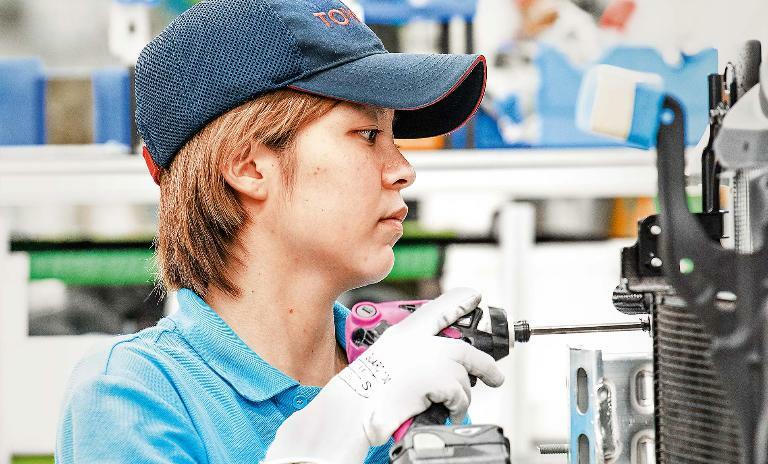 When Toyota engineers were traveling around the globe looking for ideas after Kawai ordered a return to manual know-how, they found what they were looking for at the Toyota plant in São Bernardo, a suburb of São Paulo in Brazil. "The plant there was still as good as non-automated," says Toyota employee Chiharo Naruse. "Many processes were still carried out manually for cost reasons." Toyota shipped the vintage machines from São Bernardo back to Nagoya, where they now stand on the "TSP Basic Line," an important Toyota production line in Toyota City. In Japan, workers are now being trained and encouraged to learn from the "spirit of São Bernardo." The idea is that through manual work on relatively simple machines, the employees will once again learn to appreciate the "efforts and struggles of our predecessors, who had to build this production line with a limited budget," as a company video puts it. Budget is a keyword. If Toyota has an automation ratio that is barely greater than 10 years ago – sources put the machine-to-human ratio at less than 10% – this has financial reasons as well as the pursuit of quality. Kawai says: "If you immediately start with automation in production lines, you get highly complex systems that are also very expensive and often stand idle." He now keeps a close eye on the manual laborers and only reintroduces robots step by step where it makes sense. Later the production method is exported to all Toyota plants worldwide. "We built an engine production line that was completely simple and completely manual, and then we automated it step by step. It is now in use worldwide," says Kawai proudly. Fifteen years ago it occurred to Kawai that the knowledge of once highly specialized and skilled workers was gradually being lost. "There had been fewer and fewer opportunities for team members to use their skills and ideas," says Kawai. "That bothered me. And I asked myself how could we use our employees' skills and know-how, yet still build automated processes." Homegrown Inspiration: Toyota believes it is human employees, their skills and ability to inspect their work, that drive innovation. Toyota's approach is radically different from that of other automakers. Just think of flamboyant Tesla CEO Elon Musk who, until recently, was talking about a "lights-out factory" as his vision for the future: no workers, just robots. Because robots don't need to see, no lights would be required. Investors like that kind of talk and usually applaud any decrease in labor costs as a strong indicator of cost reduction. But even Musk has had to revise his vision: After massive criticism of supply backlogs for Tesla's Model 3, he acknowledged that excessive automation was a mistake. "Humans are underrated," the Tesla CEO said. Kawai is polite but clear regarding his views on Musk's humanless robot vision: "Such a factory would always remain stuck at the same stage of development. Robots cannot improve processes. Only people can do that, and that is why they are always at the center of our attention." This approach to automation is not cultural or "typically Japanese," says Classen, but rather part of Toyota's corporate culture – and that means it can also be applied to other automakers or manufacturers in other industries. "The best proof of this is that tested methods such as the Toyota production system work not just in Japan, but also in Toyota's plants in other countries, such as South Africa or Eastern Europe," he adds. "Other manufacturers could learn from Toyota, they just have to want to." Toyota's careful approach toward automation has the potential to set a worldwide precedent and it could even start a new trend. As Kawai puts it: "We do not rely on systems or robots for progress, but always on our employees, on their good ideas and their skills." Sixteen of those employees are engaged at Toyota's most modern final assembly line, the Motomachi Plant. They float about on the bright blue, shiny floor between the tool and material shelves, all of which are mounted on wheels so they can glide with ease. They are helping to produce the Mirai – a hydrogen-powered car of the future which has sold 7,000 so far. These 16 workers help build nine Mirais per day in their workshop, completely by hand. It is so quiet and clean that it feels like a hospital operating theater. Each step in the process is checked off on a tablet computer. A transmitter relays the exact torque of every screw that is tightened via Bluetooth. It's so incredibly high-tech – but there isn't a robot in sight. The Motomachi Plant not only produces the cars, but also trains all Toyota employees worldwide. It is a kind of mother plant for all Toyota locations. "If we used robots here, we wouldn't be able to do this work manually and we couldn't teach our workers anything," says Akifumi Karasawa, one of the managers. "Here, we deliberately assemble cars without robots." Of course many robots are in use in other, faster Toyota plants where cars roll off the production line every minute or so. But even there, Head of Manufacturing Mitsuru Kawai sees robots as helpers for his workers, as tools, and not as substitutes for human labor. The Toyota initiative indicates that robots need not necessarily lead to job losses, and nor should they. In Mitsuru Kawai's vision of Toyota's future the focus is human and not robot-centered. The manual laborer turned head of manufacturing puts it in his own words clearly and directly: "People will always play an important role with us," he says. "The same employees who used to build combustion engines are now building electric motors or hydrogen-powered cars. Everything is changing, technology is moving forward and automation is also progressing, but all these employees are still with us." For Toyota's factories of the future it seems that the lights could be staying on for some time yet. 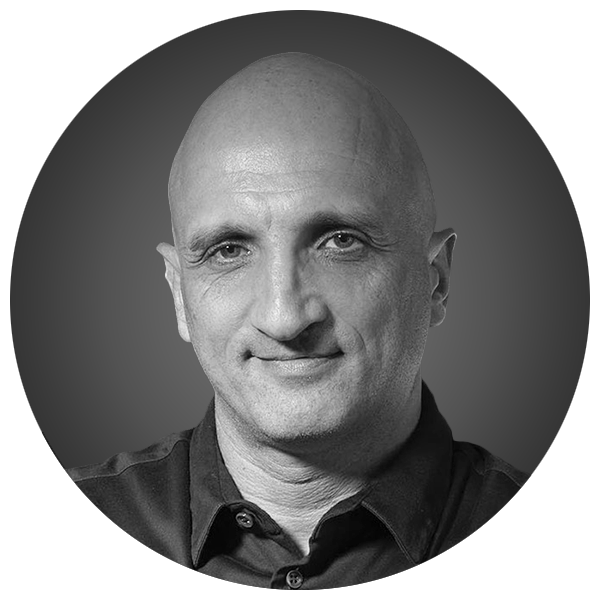 Henrik Bork is Managing Director of Asia Waypoint in Beijing, providing strategic communications advice to CEOs in China, founder of an internet startup company in Beijing, and frequent public speaker. Born in Paderborn, he studied in Munich and graduated from Henri Nannen School of Journalism in Hamburg. For eleven years, the Beijing-resident worked as bureau chief of Sueddeutsche Zeitung in China and Japan. He has been living in Beijing for nearly three decades now.